More than 85,000 attendees from around the globe converged in Orlando, Florida, on Jan. 9-11, 2018, for this year's International Builders' Show, hosted by the National Association of Home Builders®. Once again, the Oldcastle® family of brands was excited to be a part of the show to increase awareness of the Oldcastle Builder Solutions program, which includes a comprehensive portfolio of high quality architectural products, cost-saving efficiencies and technologies, engineering and design services, and other business-building programs specifically geared for the residential design/build community. Below are some highlights and learnings from this year's show. As sustainable landscape architecture continues to be a growing trend in the residential market, builders showed a tremendous interest in learning more about the potential uses of permeable pavers for residential construction. Topics of interest included rainwater harvesting, as well as using permeable pavers for infrastructure within residential developments as a means of increasing the amount of land available for development. Examples included both addressing impervious cover restrictions and eliminating the need for detention ponds to manage stormwater. Mirage® porcelain wall veneers were introduced at this year's IBS and were very well-received. The wall veneer line coordinates with Belgard Porcelain Pavers to create cohesively designed outdoor living spaces. Builders loved the upscale look, durability and stain-resistance of the product line. They were also impressed by the versatility of the product in using it for both indoor and outdoor applications. Many builders noted that the product would work particularly well for mudrooms or kitchens to create a sense of flow with an adjacent outdoor living space. 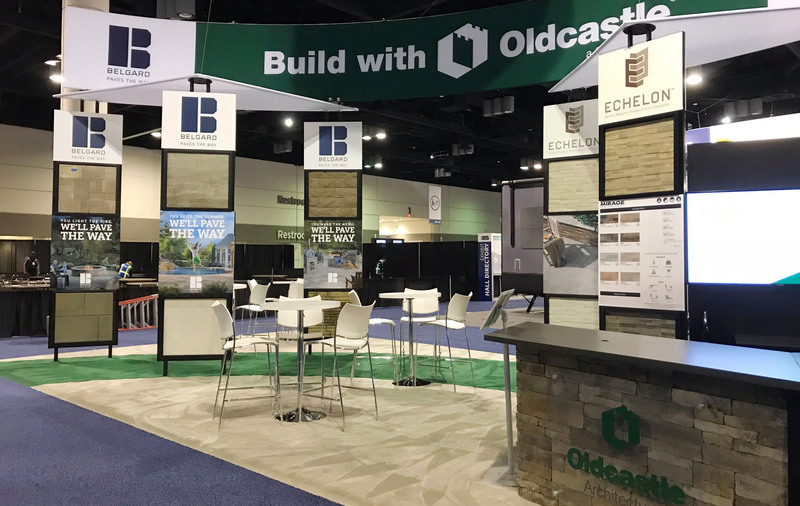 Acquired by Oldcastle in 2017, this was the first IBS for MoistureShield™ Composite Decking to exhibit in conjunction with other Oldcastle brands. Builders were particularly interested in the aspect that MoistureShield™ decking, Belgard® hardscapes, Echelon Masonry™, and Amerimix® mortars and stuccos could all be obtained through a single source, simplifying the process and presenting cost-saving opportunities. Builders were also interested in the fact that all of the Oldcastle brands are high-quality products, thus improving the marketability of their homes by economically increasing the value and aesthetics. Builders were interested in learning that the Oldcastle Builder Solutions program includes a wealth of professional resources, including engineering and design services, environmental solutions, site optimization planning, CAD files, and a variety of continuing education opportunities.